We all love it when we have a stella sales month, but wouldn’t it be great if you knew what made it happen so that you could predictably produce another stella sales month at will? Yes these make up part of the numbers you need to know, but there are many more you can learn that can unlock HUGE potential in your business, potential you probably didn’t even realise was there. In this article, we’re going to go through 8 undiscovered numbers that will tubocharge your sales and transform your business. Before you can do this though, you’ll need to have gotten your sales process setup properly. Once you’ve got some structure and order to your sales process, you’re now in a position to start leveraging and building off all that hard work. By learning what numbers you need to know and how they impact your overall results, you can begin to see whether you’ve got a stella sales month coming. On the flip side, you can also see if a not so stella month is on it’s way so you can take action early and prevent a crappy bank balance. This refers to how long someone (a lead or prospect) has been in your sales process. You count it from the day their enquiry comes through until today. For example, if they made a website enquiry on Saturday, and you see and respond to it on Monday, then they’d have already been in your sales flow for about 2 days. If someone has been in your sales process for a very short time, you can consider them “Hot” (or at least warm). At this time, the lead or prospect will typically be more responsive because they are in some part of the buying mode. They could be looking for information such as whether you can potentially help them, or what something might cost. Knowing the number by itself is fine, but how do you know what is a good number? 2 days could be a very short time if it was a business type customer who doesn’t expect to be gotten back to until the next business day (i.e. Monday). However, if you’re selling products online or you have a vendor who is available on weekends, you might find that by the time you come back to the lead on Monday, they’ve already purchased from someone else. What you want to do here is look at how this number compares (for one lead) to other successful sales you’ve already had. Another way to say this might be against your “ideal average”. Consider your last 10 sales. If those people were in your sales flow for an average of 10 days before buying, you could look at the current lead ( 2 days ) compared to 10. This would suggest that lead should be fine, and there are still 8 more days to complete the sale. Some people may take more than 10 days, some may take less. The point is once you have an ideal of your “ideal average”, you can get an idea if something is going well or needs to be looked at. If you can’t figure this out easily, then you may need to start using something to help keep track for you, such as a spreadsheet or some software like Ninjodo that can do it for you. This one is definitely a little easier to get, it’s quite simply the last time the lead was contacted, and accordingly, how long since they were. Last Contacted can refer to receiving an email, a phone call, a meeting, a piece of marketing material or even an advertisement (this last one is much harder for you to track though). It’s relatively easy to keep track of the emails you’ve sent someone, but what about the other events (phone calls and meetings). If you have a team, when was the last time someone else contacted them. As you get bigger or your team grows you’ll want to be using a system that keeps track of this automatically for you. One way to help make sure you don’t have huge gaps or get stuck with weird/awkward follow up is to always book the next event before you finish the previous. For example, before you finish a phone call, make sure the last thing you do is to schedule the next call or meeting. This keeps the process moving along and keeps you in control. You want to keep in constant or continuous contact. The basic rule of thumb here is, the longer it goes, the worse or harder it becomes. With conversion ratios we are talking about how many people go from one step in your sales flow, to the next (or another) step in your sales flow. We’d all love to convert 100 enquiries into 100 sales (if you can do that, give me a call I’d love to pick your brain over lunch). More realistically, some will say no, some will say maybe, some need more time to think, some will say yes but later, and some will say yes let’s do it. At it’s most basic level you want to know, for every 100 (or 10) people into my sales flow, how many sales do I make. Is it 50? 25? 10? 1? By knowing even this most basic conversion ratio, you can figure out how many leads you need in at the top of your sales flow, to make sure you get the sales you want at the bottom. Let’s say your conversion ratio is 10%. So for every 100 leads, you get 10 customers (or sales). And you know that 5 customers a month will give you the amount of money you need or want to feel good about the results for that month. This tells you that you need to have 50 leads a month to get your 5 customers, which should give you the sales you are after. Easy peasy. Well doing the math might be, but getting 50 leads may not be. And here’s where the power comes, let’s say you could figure out how to increase your conversion ratio from 10% to 15% meaning for every 100 leads, you converted 15 into customers. Now you would do what equation? We take the number of customers we want and divide it be the conversion ratio: 5 / .15 = ? BOOM! Now you only need 34 leads to get the sales you want. That’s 16 less leads you need to find. But get this, if you can still find 50 leads, and you’re now converting 15% of those, then you will now get 7.5 sales for the month. This means you’ve just increased your sales by 50%. All from getting just 5% better at converting leads into sales. Let that sink in for a minute before we move onto the next one. How do you get 5% though? We’ll leave that one for another article, just know that it’s much easier than you might think. Knowing how many people are in your sales flow is quite interlinked to conversion ratios. It’s quite simply as the name suggests, the total number of people in your sales flow. 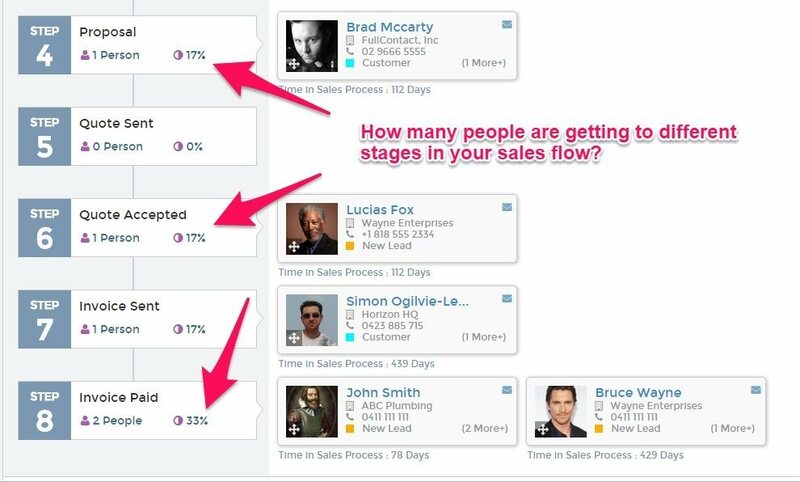 When you know how many leads you convert into sales or customers, you can easily then look at your sales flow (also referred to at this time as your “sales funnel”) and get a good idea of whether or not you have enough people to get to your 5 target sales. Assuming you are converting at 15% from our previous example, then you need to make sure there are 34 people in your sales flow at all times. What can often happen is we give all our focus to the 15% until we convert them into sales. Once this is done, we are then left with 34 people who are not likely (based on our history) to actually turn into customers. Unless some new leads enter our sales funnel, then we have no more sales coming in from our current activity and it tells you that it’s time to get marketing to find some more. Of course you could choose to focus on the 34 now and try to convert some, but chances are they’re not the ones who will buy from you (Not all leads are created equally), otherwise you’d have already made them customers while working on the 15%. Depending on your business, you may sell just 1 thing or multiple things. You may also have people buy just 1 thing or multiple things from you. Understanding the $dollar value of your average sale allows you to do a bit of reverse engineering. Let’s say you want to make $5,000 (or $50,000 for that matter) in a month. If you know what one sale is worth on average to you, then you can quite easily figure out how many of those you need to make up your target for the month. First we need to figure out our Average Revenue Per Sale by looking at our history. If you can, try to find out what it was for the same period (i.e. a month) and then a few months. At the very least you could take the last 10 sales (or even 5 if you’re only just starting out). Once we have the total number in $dollars, we then divide it by the total number of individual sales (10). The table below shows how to work it out. Let’s work through the example. Seeing as we have both numbers from our examples above let’s do the math on both. In example 1 (using just last month’s sales) our average revenue per sale is $738. If we want $5000 next month then we need to figure out how many $738 sales will get us over the $5,000 mark. $5,000 / $1030 = 4.85 (which becomes 5). Once you’ve got these numbers, go back up to #3 and using your conversion ratio, figure out how many leads you need (remember, dividing by 10% or 15%) to make those sales, and then look at #4 and make sure you have the right number of leads in your funnel. If not you know you need to go do some networking or marketing to get some more leads. Imagine that, knowing whether you were on track to hit your sales BEFORE the month started, instead of AFTER it’s too late. 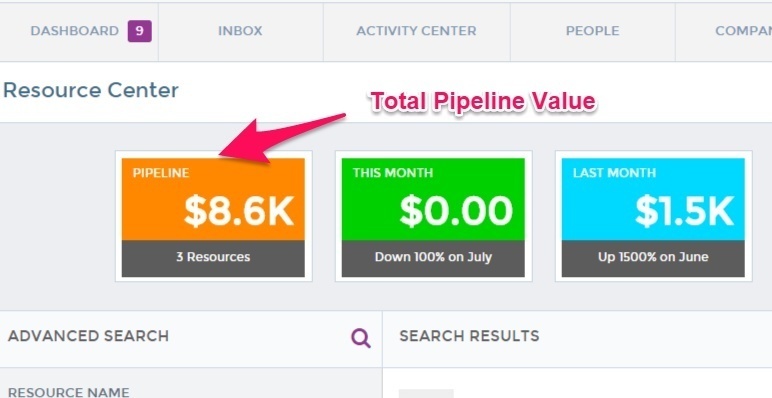 One of the more simple and perhaps easier ones to use is Pipeline Value. This can be a really handy and quick visual to figure out how much potential revenue is available for you to bring in. It refers to the total $dollar value of all the leads you’re currently talking to. You wont be able to figure this one out until you’ve spoken with or contacted your leads to determine if they’re serious or not and what they think they are wanting to buy. 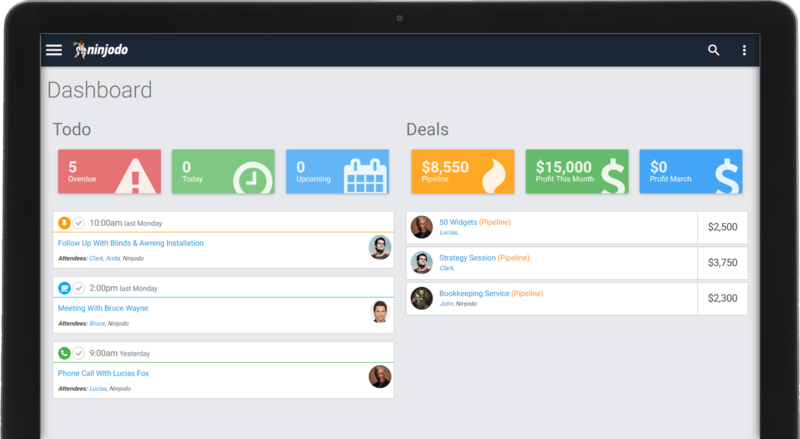 It also helps if you have software to keep track of your sales, deals & pipeline, as this will automatically calculate your total and save you all the hassle (Like Ninjodo for example 😉 just saying). If you were talking to 20 people and 10 of those leads (or 50%) had actually expressed interest in buying X product (or service) from you, and let’s keep it simple and say the price for X was $150. You would have $1500 in your pipeline. That is, the value of your leads right now is $1500. This number works wonders for trying to plan cashflow and make sure that you have sufficient activity in your sales funnel that will likely result in sales, and therefore money in the bank. If you know you need $10,000 next month, and you’re pipeline has $20,000, provided you are confident you’ll close at least half of those deals, then you can rest easy. If however you know that you only close 25% of most deals, then you might have a bit more work to do. Can you see the pattern here? Each number is designed to tell you whether you are on track or not to intentionally moving your business where you want it to go. And knowing these numbers on a monthly (and weekly if you can get there) basis, gives you the best chances for success. Here we’re talking about New Leads vs Existing Customers in your sales funnel. If you have 10 hot leads that become sales, 6 are new leads from marketing or networking, and 4 of them are existing customers wanting to buy something else from you. That means you have 60% of your sales coming from new business, and 40% of your sales are from previous customers (also referred to as “repeat business”). The stats that get thrown around are that an existing customer is 16 times more likely to buy from you than a new one. Why? Well you already have a track record with your existing customer, they know what to expect, hopefully you’ve already wowed them with their first encounter. Ultimately, there is a level of trust that has developed, so they feel comfortable buying from you again. Knowing the split here can help you to plan your marketing efforts. If you don’t have any existing customers buying from you again, then it might be time to start thinking, why not? You’d be surprised how willing your customers are to give you this information. Once they do, you then have an immediate customer/sale available once you figure out how to offer them what they asked for. This one is often never paid any attention. Here we are talking about, how long does it take for someone in your business to respond to an enquiry from a new lead. Generally, the longer it takes to get back to someone, the less likely they are to keep going down the path with you (or at least the harder you make it for yourself). Whether people admit it or not, whether they even realise it or not, everything you do throughout the sales process with your leads matters. They are forming impressions of you, your website, your business, your products and services, your customer support, how contactable you are, your attention to detail, everything. And when a new relationship is starting (i.e. the one between the prospect and your business), it develops in microtime chunks, which then get stretched out as the overall generalisation. All these types of impressions happen at an almost subconscious level, and once they start to develop, it can be hard to reset them. Thanks so much for getting in touch with us, and hope you had a great weekend. My apologies for the delay getting back to you Saturday when you’re enquiry came through, but we’re only in the offices from Monday to Friday during business hours. When would be a good time for me to give you a call to discuss your enquiry? You might notice that this one is similar to the Last Contacted one. Very true, they go hand in hand. This Time to First Response however, is the most crucial as it can set the trajectory for the entire relationship that follows, so make sure you get off on the right foot, and if anything happened to hinder that, nip it in the budd nice and quick. If you don’t have any of this information, grab a pen and paper and work out some of the numbers. You can use either your accounting software such as Xero to get the data you’ll need really quickly, refer to your business bank statement, or even just do it from memory. The key here is to get some numbers from somewhere and practice how to known them in your business. Start with #6 (Total Pipeline Value) it’s often the easiest one to find, then move on to #4 (Total Leads In Your Sales Flow), and then onto #5 (Average Revenue Per Sale) & #6 (Conversion Ratios).